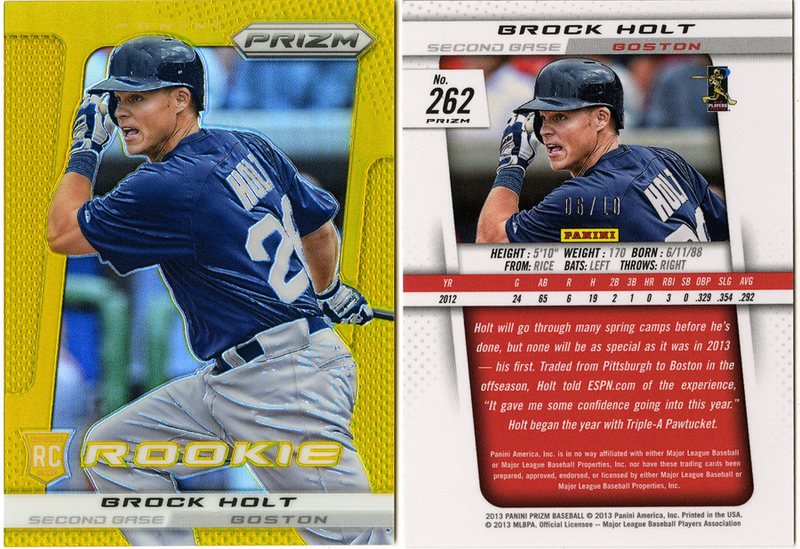 The insanity that is the Brock Holt collection continues on. There’s just four additions, but they are considerable ones. Let’s start out with a little trip back in time, to the Minor Leagues. 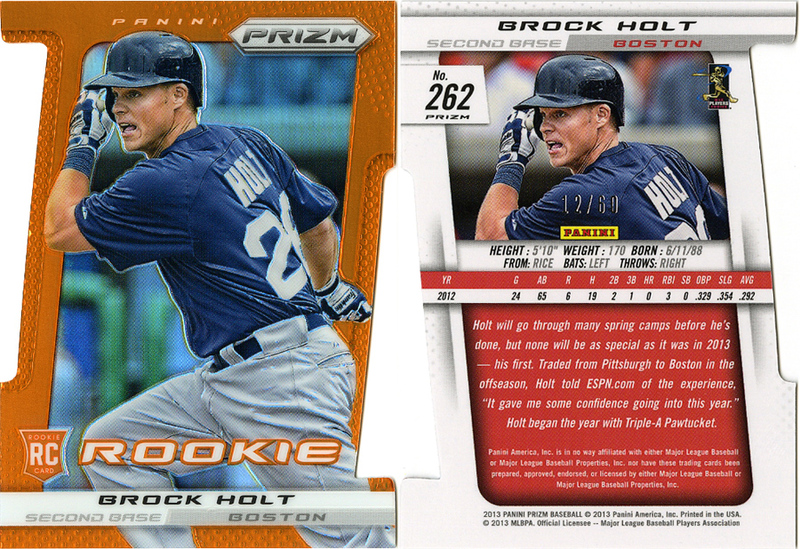 These two (base card and insert All-Star card) are from 2010 Pro Debut. There are only a few Holt cards from the minors are they are surprisingly hard to find. 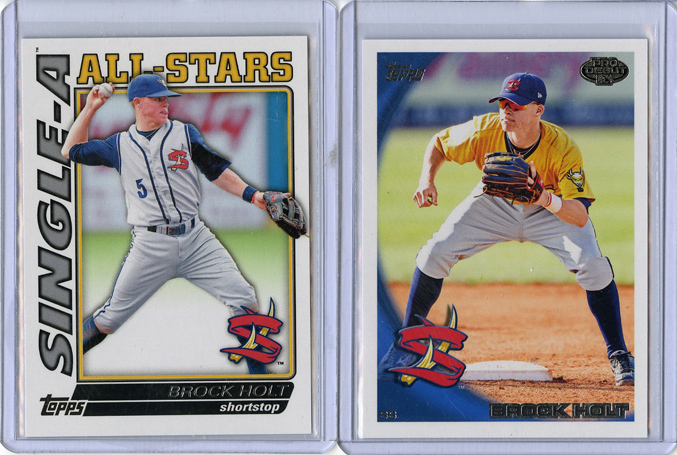 There are a couple parallels from 2009 Donruss EE still to find and a “2009 State College Spikes” card, but these are the two major cards to check off my list. Boom. Six out of ten. 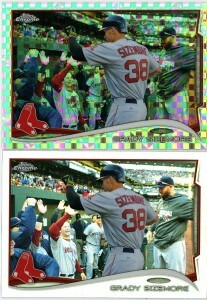 A rare Gold Parallel from the same set. This was the first and only I had ever seen, and I couldn’t throw money at it fast enough. It actually didn’t end up being that much in the end, and I was greatful my bid stuck. 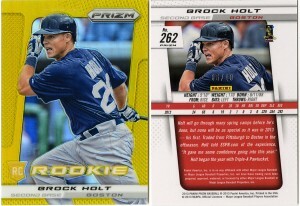 That is the 9th card for Mr. Holt that I had that’s numbered to 10 or less. I think it’s safe to say I have a fairly extensive collection at this point. 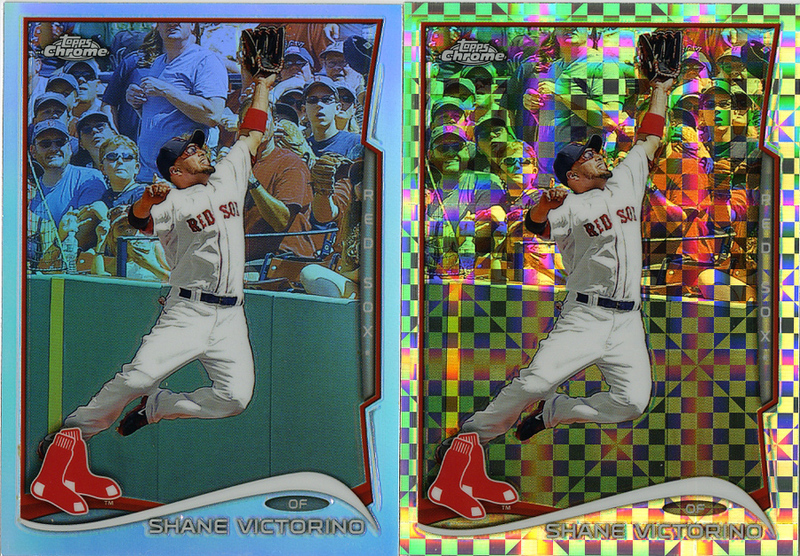 I know I own 3/10 of the worlds copies from Tier 1, and 2/5 of the world’s supply of Bowman cracked ice. Does that make me a super collector? 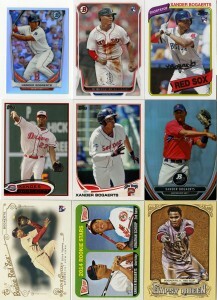 I decided to go ahead and clear a spot in my player binders for Xander Bogaerts. He’s not going anywhere, the Sox are clearly invested in him and since moving back to SS he’s been more confident and it’s translated into his play. I think, with the exception of the 2013 Pro Debut and the Archives cards, that I actually had all these, but I like to maintain the team sets as they are and my player collections are strictly duplicates, which means I needed another copy of most of these. The whole collection came together and included multiples of each card. I think there were 20 or so cards all together. All together they make a nice group/binder page. 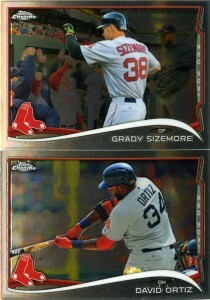 The 2013 Pro Debut and the Ginter are probably my favorites, but the photo they used for the GQ card is equally awesome. Chrome doesn’t have issues, well, actually that’s a lie (it has plenty), but it’s more of a “me problem”. I don’t actually like Chrome. I know, that’s nearly heresy. I keep buying them and I don’t really know why. It’s like buying a car, keeping it nice and shiny, and never driving it. There’s just no point. I don’t “get” Chrome. It’s the SAME SET as flagship, only smaller. It hardly has any exclusives except usually that one rookie card everyone wants and it over-printed anyway. The auto checklist is slightly different and the inserts are somehow more insane. The only real reason to like Chrome are the parallels. If you like chasing the rainbow, Chrome is your crack. I guess that’s part of the appeal and even a little bit why I buy some, but it’s a terrible affliction to have. There’s really no end once you start chasing parallels. 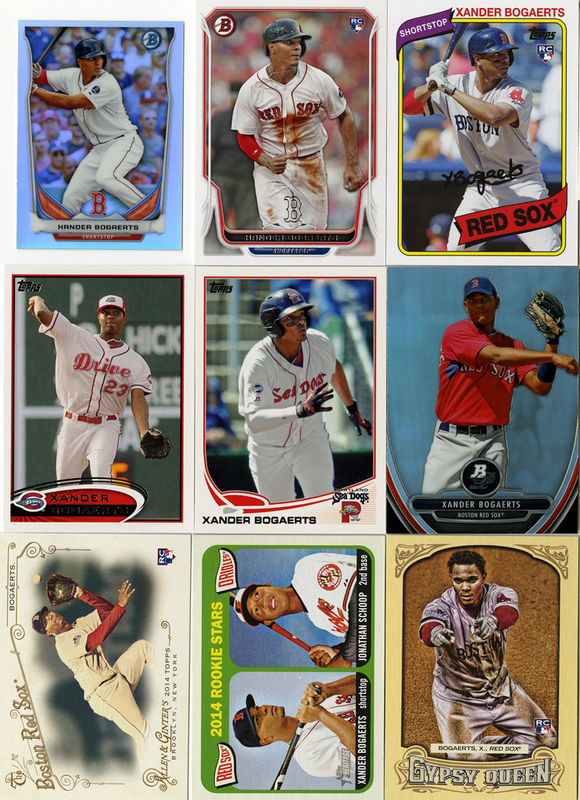 The other issue I have with Chrome is the hobby box set up. After buying a box of 2012 and a box of 2013, it’s become abundantly clear that “getting what you want” is not part of the deal. 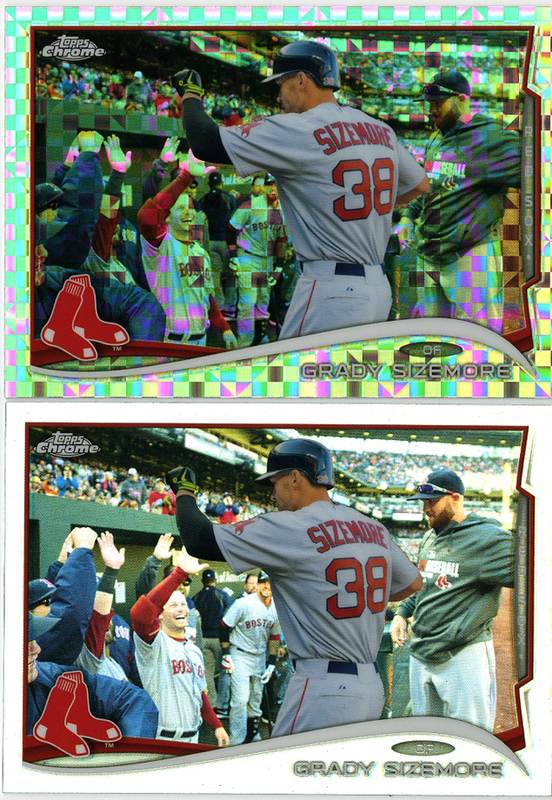 The refractors and colored parallels are far too few and far between, the autos are terrible and it’s generally just a mess. Unless you’re busting a case, or pull a super-fractor there’s no earthly way you’re going to walk away happy with Chrome. So, what’s the alternative? You capitalize on the misfortune of others. All of these, and the ones I’m about to post below, came from a single seller, as two lots, for under $5 combined. Some poor case buster was looking to make his money back on his terrible investment, and I walked away with pretty much what I wanted for pennies a card. 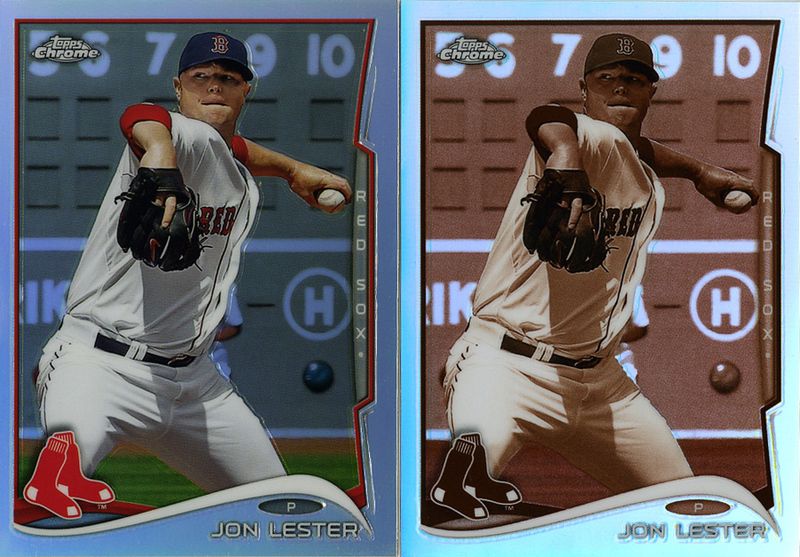 Yup, those are Blue parallels (/199) and even the /99 Sepia Lester in the bottom corner. This is how I buy Chrome. No more 4 card packs, no more blasters of junk. “Lots” of cards no one else wants, so much so that the sellers hardly even list anything beyond “you get all the cards in the pic”. Love it. 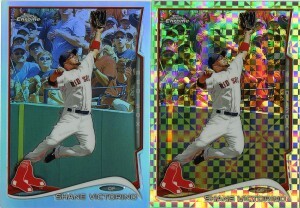 All together I’m one Mike Napoli refractor away from a complete set of those, a 3 X-fractors short on that set. I won’t bother chasing the blue and the sepia. I get my fill of Chrome pretty quickly and then give up. That’s ok, it’s not like anyone is hurting for parallels to chase these days. That also fits with my philosophy on parallels anyway. It’s the “nice if you’ve got them” principle. I don’t need any parallels. 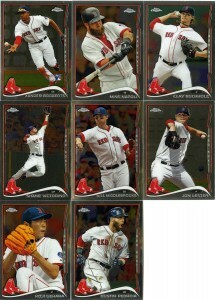 I need, in the deep seeded, completionist, collector sort of way, I need the base team set. I must have it. The parallels, they’re nice, they’re shiny, but after a couple, I’m good. I don’t go nuts chasing down every single variation. I’ve tried to do that with my Holt collection and it usually only ends in pain. 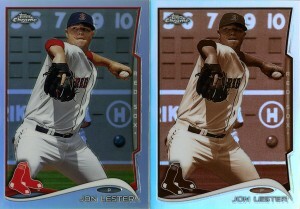 One parallels is nice, two is better, but I’m never going to lose sleep over not having that 16th and 17th copy.